There is nothing more glamorous than a day full of fun in the sun, especially when your little darling is along for the adventure. 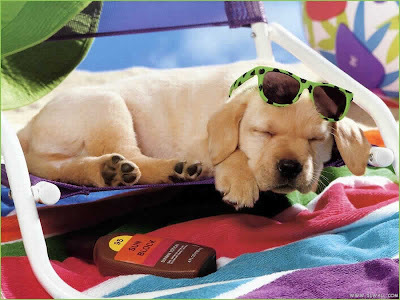 But just like us humans have to slather on the sunblock, Fido also needs some sun protection as well. According to THIS article, lighter pets or pets who are shaved have the highest risk of sunburn, but all dogs with exposed areas should be protected. The most likely places for burns? Dogs abdomens, noses, groins, and inner legs tend to be the most sensitive. Remember that sunlight can reflect up from the ground and roast these seemingly protected areas. When choosing the right sunscreen for your pooch, make sure you check the ingredients list. Non-toxic, non-irritating formulas are best, especially since dogs love to lick themselves. And while there are specific sunscreens made just for your pooch, sunscreens made for babies or sensitive skin are also an option. If you want to go the natural sunscreen route, THIS is a great article detailing sunscreen basics and what to look for when shopping for a product. It is an older article, so I don't know if the prices that are listed are accurate, but the information is still useful. Daphne and I like Vet's Best Sun Spray Sunscreen. It's easy to apply--just cover the eyes and spray away!